This pomegranate chia seed pudding with a hint of ginger makes for one easy, delicious, and nutritious gluten-free & vegan breakfast, snack, or dessert! 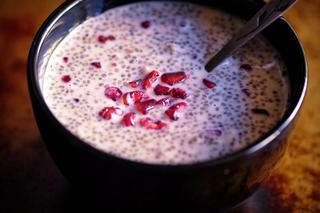 I simply adore chia seed pudding! I find it to be one of the easiest ways to get a nutrient-packed breakfast in with very little fuss. Chia seeds are rich in fiber, protein, omega 3 fats, calcium, magnesium, anti-oxidants, and B vitamins! They truly are magical little seeds with a wide array of healthy benefits. In this version of chia seed pudding I incorporated fiber and vitamin C-rich pomegranate juice and arils, a hint of spicy ginger, and a touch of honey sweetness. It is: easy to make, perfectly sweet, subtly spicy, creamy, juicy, nutrient-dense, and positively delicious! In one large bowl or jar combine milk, chia seeds, honey or maple syrup, vanilla, and ginger. Stir or shake to combine.Cut pomegranate in half and let the juice run out into your pudding mix. Scoop out all of the arils (seeds) and stir into your pudding mix until evenly combined.Either cover your large bowl or jar, or pour mixture into desired serving containers before covering and refrigerating overnight (or at least 6 hours).When ready to serve remove from the fridge, uncover, stir and enjoy!